From leather apparel to engine retooling, Shoeman’s Custom Cycle has it all in Reno NV! Call 775-348-9339. The oldest and best equipped independent motorcycle shop in Northern Nevada, since 1988. Need precision engine rebuilding in Reno, Nevada? Looking for a new leather jacket? 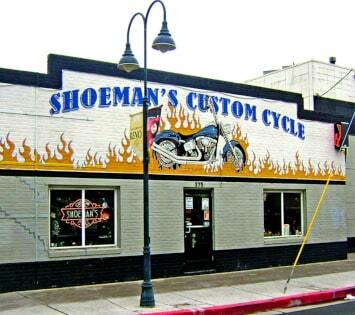 Welcome to Shoeman’s Custom Cycle, located in Reno, Nevada. We are a complete motorcycle machine shop specializing in motorcycle repair and accessories. Call us in Reno at 775-348-9339 to learn more. Since 1988, Shoeman’s Custom Cycle has been offering high-quality motorcycle repair, precision engine rebuilding, parts, service and accessories to hundreds of Harley and custom made American motorcycle owners. We’re dedicated to our craft, and our expertise shows: we can repair what the other guys can’t! You can rely on our professionals for a job well done. Our repair service is nationwide. We ship every day! Don’t worry if you’re not located in the Northern Nevada area. We’re still happy to help you with your motorcycle. We are known for our exceptional customer services – give us a call today and we’ll schedule your next repair. Like What We Do? Leave Us a Review! Need motorcycle repairs or rebuilding?